APRIL 27, 2013… Recipients of the 2013 Jane Addams Children’s Book Awards were announced today by the Jane Addams Peace Association. Since 1953, the Jane Addams Children’s Book Award annually acknowledges books published in the U.S. during the previous year. 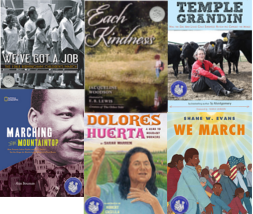 Books commended by the Award address themes or topics that engage children in thinking about peace, justice, world community and/or equality of the sexes and all races. The books also must meet conventional standards of literacy and artistic excellence. Each Kindness, written by Jacqueline Woodson, illustrated by E.B. Lewis and published by Nancy Paulsen Books, an imprint of Penguin, is the winner in the Books for Younger Children Category. We’ve Got a Job: The 1963 Birmingham Children’s March, written by Cynthia Levinson and published by Peachtree Publishers, is the winner in the Books for Older Children category. Each Kindness Small actions, or the lack of them, can be haunting as is the case for Maya and for Chloe in their rural elementary school. This open-ended, profound tale created in free verse and sober watercolors glimpses interactions between Chloe and Maya, the new girl arriving midyear in broken sandals, before the teacher invites students to ponder their kindnesses. We’ve Got a Job In 1963, four thousand young African American students, from elementary through high school, voluntarily went to jail in one of the most racially violent cities in America. Focusing on four of these students, this photo essay recounts the riveting events throughout the Children’s March. Dolores Huerta: A Hero to Migrant Workers, written by Sarah Warren and illustrated by Robert Casilla, published by Marshall Cavendish Children, has been named an Honor Book for Younger Children. In California in the 1950s, teacher Dolores Huerta was concerned for her students. Learning the conditions of the migrant families, Dolores became a determined activist who fought for labor rights through her words and actions. We March, written and illustrated by Shane W. Evans, and published by Roaring Brook Press, a Neal Porter imprint of Macmillan, has been named an Honor Book for Younger Children. Simple and powerful illustrations capture the excitement and hope for even the youngest reader of the 1963 March on Washington for Jobs and Freedom. The colorful crowd of 250,000 demonstrates their strength and unity in marching to Martin Luther King’s historical speech for racial equality. Marching to the Mountaintop: How Poverty, Labor Fights and Civil Rights Set the Stage for Martin Luther King Jr’s Final Hours, written by Ann Bausum and published by National Geographic, is named an Honor Book for Older Children. A long sanitation worker strike began in 1968 following the deaths of two sanitation workers on the job sanitation workers in Tennessee. The strike became part of the larger civil rights movement and brought Martin Luther King, Jr. to Nashville to support the workers in their fight for for integration, safety, better pay and union protection. Temple Grandin: How the Girl Who Loved Cows Embraced Autism and Changed the World by Sy Montgomery, published by Houghton Mifflin Books for Children, is named an Honor Book for Older Children. This biography with much first person input from Ms. Grandin herself explains how her autistic mind works, how her peers and family perceive her, and her relentless efforts as an activist. A national committee chooses winners and honor books for younger and older children. Members of the 2012 Jane Addams Children’s Book Award Committee are Marianne Baker (Chair, Barboursville, VA), Ann Carpenter (Harwich, MA), Julie Olsen Edwards (Soquel, CA), Lauren Mayer (Seattle, WA), Beth McGowan (DeKalb, IL), Sonja Cherry-Paul (Yonkers, NY), Tracy Randolph (Sewanee, TN), Lani Gerson (Watertown, MA), Susan Freiss (Madison, WI), and Jacqui Kolar (Chicago, IL). Regional reading and discussion groups of all ages participated with many of the committee members throughout the jury’s evaluation and selection process. The authors and illustrators of the 2013 Jane Addams Children’s Book Awards will be honored on Friday, October 18, 2013 in New York City. Details about the award event and about securing winner and honor book seals are available from the Jane Addams Peace Association (JAPA.) Contact JAPA Executive Director Linda B. Belle, 777 United Nations Plaza, 6th Floor, NY, NY 10017-3521; by phone 212.682.8830; and by email japa@igc.org.